With everyone's attention focused on the GI Joe 25th Anniversary Collection, it's easy to forget that there were still plenty of good figures released before the line got an upgrade. When Devil's Due Publishing began their GI Joe comic, the characters were mostly carried over from the original Marvel run. But eventually new Joes began to show up, and issue #28 marked the comic debut of Barrel Roll, kicking off one of the most interesting subplots of the modern books: Barrel Roll was a member of the Joe team, but his brother Blackout worked for Cobra. Drama! But there was a third member of the family that was only hinted at - Blackout's filecard mentioned a sister, "Cadet Bombshell." It took two years for her to finally see release (in 2005), but the wait was worth it. Bombstrike always hits her target, whether it's scoring a goal in soccer or calling in the correct coordinates for an air strike. She's at the leading edge of the action, her eyes taking in all the details and calculating what will give her team the winning move of the day. In soccer, where it's only a game, she's a gracious loser. But it's different in battle, where lives are at stake. That's when Bombstrike plays to win, with focused intensity and uncompromising courage. She was last seen during an assault on a Cobra base. When the fighting was over, Bombstrike had disappeared. Because her brother Barrel Roll saw their brother Blackout among the Cobra forces, he's sure that his brother planned the kidnapping. The GI Joe team will not stop searching until they bring back their missing comrade, safe and sound. Bombstrike (the name was changed for trademark reasons) is one of the few women ever released for the GI Joe property. The early days of the line saw one female released per year, but that was among dozens of men. Sure, there were ladies in the comic and even the cartoon, but toys? Not so much. A few inelegant repaints, but no new characters. Until Bombstrike. The figure looks great - certainly a ton better than any "G1" Joes. Bombstrike is wearing camo pants, a grey belt and a tan shirt with the GI Joe logo on it. This is a nice, plain military figure; in fact, she's so "real world" that she could even be a civilian. Her face doesn't seem to betray any emotion, but she doesn't look like an airhead, either (despite the wavy blonde hair). You get the feeling that Bombstrike is a woman who knows what she's doing, and brooks no interference. Like the file card said, "focused intensity." 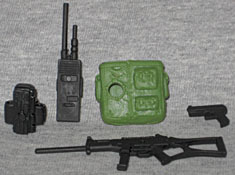 Bombstrike comes with a large rifle and a handgun, but her main accessories fit with her role as the team's forward air controller: she's got a big radio and a backpack to keep it in. The radio is detailed well - though it would look large even in the hands of a figure twice the size - and slips into the backpack well. There's a small divider in the bag to keep the radio tucked to one side, and a strange hole in the bag over the radio. Is that something that real military radio totes have? Bombstrike also comes with the black "wrist communicator" that many figure of this era had, but it's not very exciting and will probably end up tossed in a box somewhere. Lurking in the savage swamps of Cobra Island reside some of the fiercest sentinels you can imagine - the Cobra crocodiles. Any potential invading force must have a plan for dealing with these creatures, or face the consequences of having their troops become dinner for these ravenous denizens of the deep. While scaly skin, foul breath, and a nasty disposition describe your typical crocodile, they apply ten-fold for their trainer. Using mannequins dressed as GI JOE team members, Croc Master trains the gators to attack and destroy, unafraid to wrestle unruly crocs into submission to exert his dominance. After the original Croc Master perished in the freighter during the Cobra Civil War, a succession of new individuals have assumed the mantle. It's not easy to maintain a grip on the position, with hungry crocs on one side and power-hungry trainees on the other, both waiting for the first opportunity to turn on their master. Okay, now that's just cool - like the file card says, Croc Master died back in the days of the Marvel comics, when Cobra Commander took revenge on everyone he felt had betrayed him. So this new figure keeps that in mind, revealing that "Croc Master" isn't the guy's name, but his title - and that while he's not the first Croc Master, he may not even be the second. He might not even be in the first dozen. That sort of nod to the existing continuity is the kind of thing that makes GI Joe such an interesting ongoing story. Visually, this isn't just an update of the 1987 Croc Master - yes, the sculpt is better, but that's a given. The days of stout, shapeless bodies with Kewpie doll heads are gone. There are stylistic connections between the original CM and this version, but they're still two distinctly different characters. In keeping with the "gene splicing" storyline of Valor vs. Venom, Croc Master's skin has a green tint, suggesting he may have been crossed with the DNA of his pets. The original figure wore a black mask and pants, and a crocodile-skin vest and boots. The modern Croc Master still has a leathery vest, but it's open in the front and has a complete croc head hanging off the back. He has another head strapped to each hip, but his boots are just normal footwear. Instead of a full hood, he has a green facemask with tubes that plug into his shoulders. Instead of a giant eyeball, his belt buckle looks like interlocking teeth. 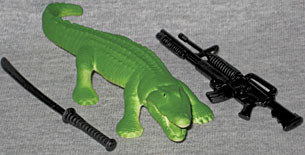 Croc Master comes with an M-16 (modified with a shotgun under the barrel) and a black machete. Like the original CM, he also has a pet crocodile - though no studded collar for it. We should probably mention that the mention of "gators" on the filecard may be erroneous - aligators and crocodiles aren't the same thing. Unless Cobra Island uses both, then the word is fine. That said, the reptile in this set has the wide, thick nose of an aligator, not the thin pointed nose of a crocodile, so there's confusion all over the place. The old accessory was larger and had a better sculpt, but this one has nicer paint apps. The Bombstrike/Croc Master set is a really good buy, with one decent Cobra figure and one truly excellent Joe. Some of the accessories are a bit odd, but overall these figures are definitely worth adding to your collection. They both share the same standard GI Joe articulation - at least, what was standard at the time. That means balljointed head, shoulders, elbows and hips, hinged knees, and the O-ring waists. No, it's not TFAC level, but it's still good. If you've read the Barrel Roll review, you know that figure is based on the lead designer for the 3¾" line, Dwight Stall. And yes, Blackout really is based on his brother Thomas - though the real guy isn't an evil traitor. Probably. Anyway, that's why both characters' birthplaces are listed as Cincinatti. But why, then, is Bombstrike's hometown Cranston, Rhode Island? Because she's not actually named after Dwight and Tom's sister. Remember, Hasbro's headquarters is in Pawtucket - about 10 minutes away from Cranston. Dwight works for Hasbro; thus, he has to live nearby. So who would have been born in a town 10 minutes away from Hasbro's headquarters? Bombstrike, Alyssa Renee Stall, is probably named after Dwight's daughter. Awww! The Barrel Roll figure had a serial number on his pants - do you think that's her birthday? Though the comics have touched on the relationship between Barrel Roll and Blackout a few times, going so far as to make both characters fairly major players on their respective sides, there's never really been any mention of Bombstrike. For those who are worried about her, though, a "Direct To Consumer" version of Barrel Roll from 2005 suggests that she was eventually rescued, but it really just raises more questions. Hopefully, when IDW takes over the comic license later this year, they'll continue the storyline started by Marvel and Devil's Due - maybe then we'll get to see Bombstrike in action.